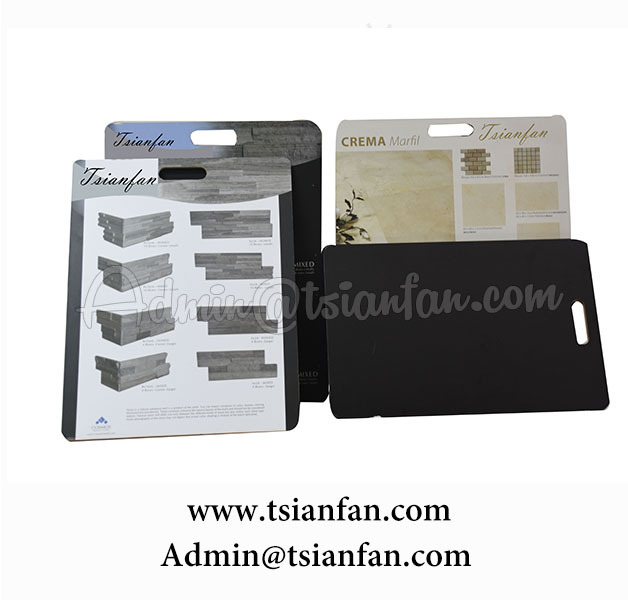 Stone Sample Boards: Which One Is Suitable For You? MDF Sample Boards – MDF stands for ‘medium density fiber’ and is made up of separated fibers. Our MDF sample boards have a greater strength, are tougher, and have a stronger internal bond than most competitive brands on the market. Chipboard Sample Boards – also referred to as particle board, this type of material is commonly used in sampling board presentations. This is a practical and cost-effective solution for many presentations, however, if companies are looking for a more durable material, they may want to consider other options for their sample board needs. PVC Board -Common color is white and black. PVC board can be sawed,be nailed and be glued.It also don’t be deformated and cracked and other special features. Plastic Sample Boards – used in situations where sample boards are frequently used and transported (trade shows etc). Because plastic is considered much more durable than wood, the chances of breakage or damage is significantly reduced.